This weekend I cracked on with a 'me time' project- this fabulous knitted hat called 'Weekender' by Woolly Wormhead. You can find more designs on her website here. There is a teeny backstory on this. It's not really very interesting so to cut a (not very) long story short, when my mum and sister were visiting last October we found the best ever yarn shop- Purl City Yarns in Manchester's Northern Quarter. They stock a great range of delightfully squidgy yarns from Artesano, to Noro, to Adriafil to Debbie Bliss to Araucania. They also have a lot of samples made up in the yarns they stock. This hat was one of them and rightly so my mum loved it and bought the pattern and the yarn to make it! Fast forward 4 months- I start following this awesome hat designer on Twitter and decide to try out one of her designs one of these days. Fast forward a further two months and I'm visiting my parents. My mum thrusts a carrier bag into my hands saying "try this if you fancy it, its that hat pattern I bought yonks ago in Manchester. I put it down for a while and forgot where I was up to......don't really fancy going back to it now but give it a go if you have the time". Fast forward to 5 days ago- no deadlines, fancy a relaxing weekend and remember this pattern (she even gave me the needles and yarn- winner!). Find it up and guess what?! It's a Woolly Wormhead design! 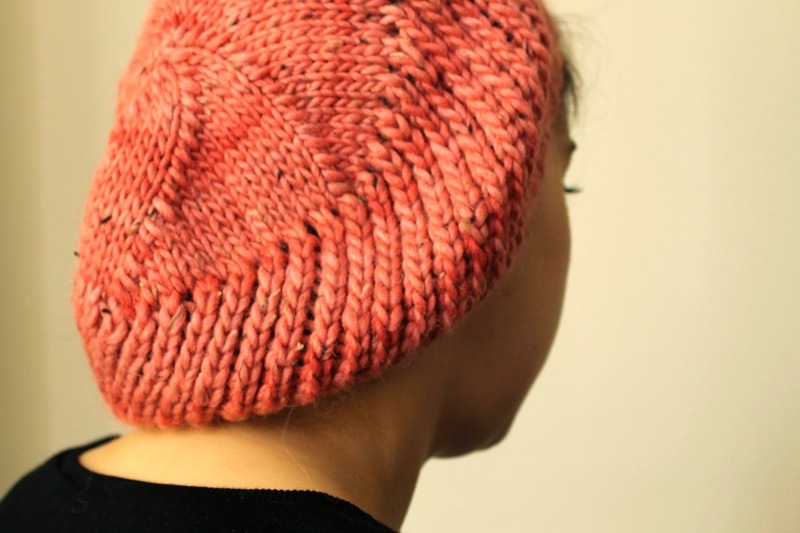 This hat was knitted in Araucania shade 810. Its a corally/salmony pink. The yarn was wonderful to worth with and beautifully soft on account of it being 30% Alpaca, 45% Merino and 15% Silk (and 10% Donegal). I knitted the whole hat on double-pointed needles as I have never got to grips with circular needles for hats. It was an interesting knit. I say interesting because there were three distinct stitch patterns meaning that I never got bored. 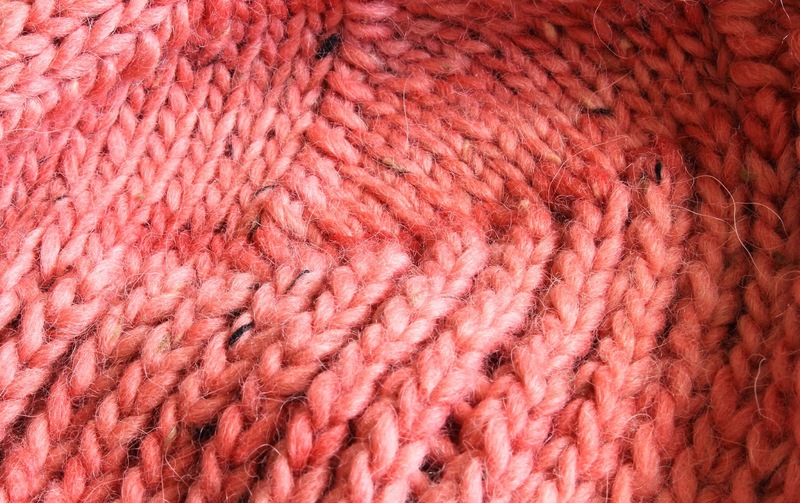 First there was the ribbed brim, then a lace-pattern involving yarn-overs and the crown was stocking stitch. Disaster struck when after a tiring day at work Sunday I was determined to finish the lace-pattern part and I must have missed a yarn over. I went into panic mode, then tantrum mode but somehow I managed to get it on track (really not sure how as I'm not a really experienced knitter! ), phew! It is a bit obvious there is a mistake but only to the trained eye (I hope!). 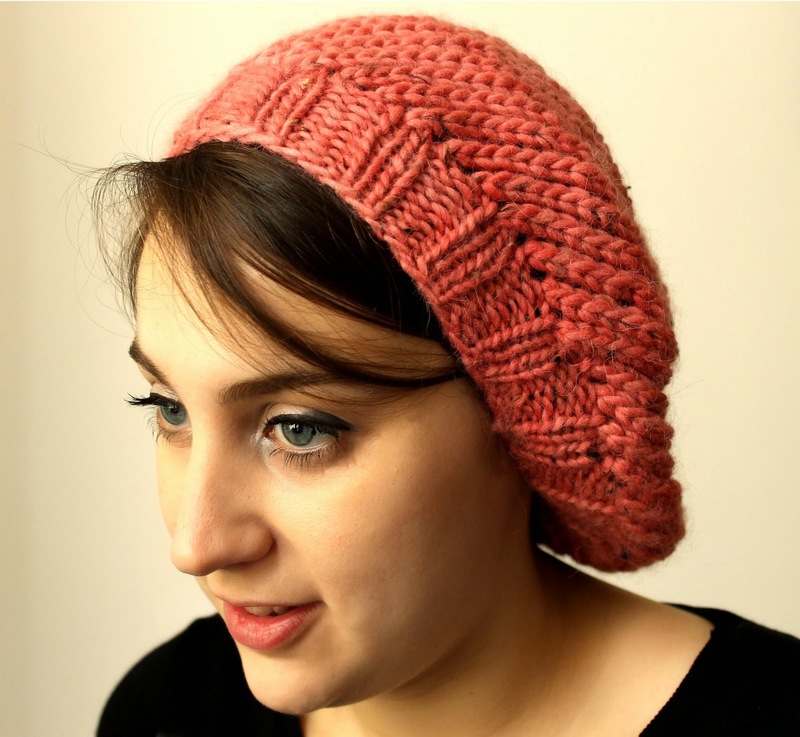 I loved everything about this hat- the easy-to-follow pattern, the scrummy yarn and the fit. 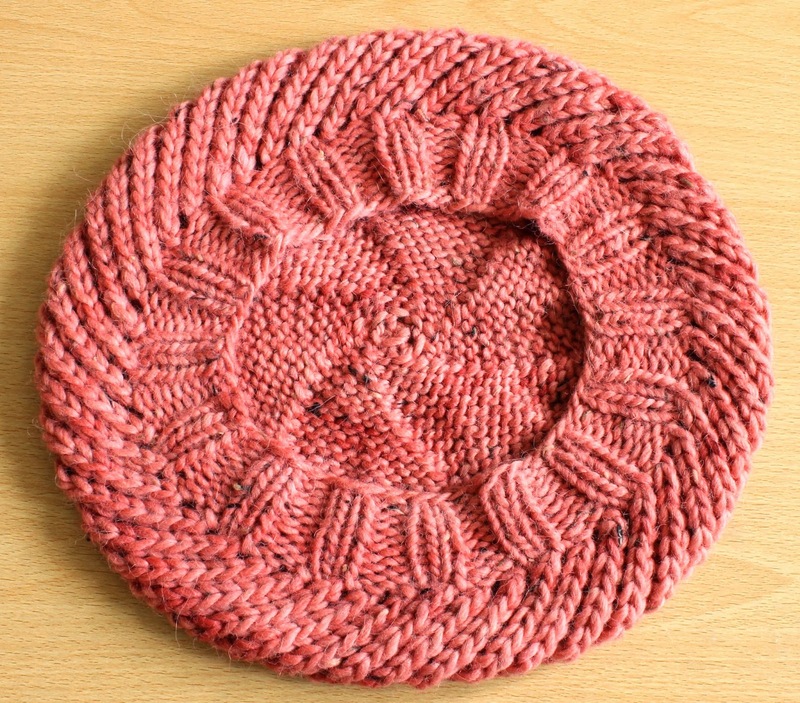 This will be in the post for my mum tomorrow but I'm very tempted to make myself one in the leftover yarn! Absolutely gorgeous! You definitely need to make for yourself. Lovely pattern and very neat knitting! Thanks Ellie! I'm going to....maybe even today! What a pretty hat!! Great color, too :-). Have a happy weekend!